Originally imaged at Great Shefford just one hour later than P/2003 O2 was first imaged on the morning of 2003 July 31 while they were both on the NEOCP, the tail was only suspected after images were obtained two days later (image b) and subsequently also suspected on image a. The Central Bureau were notified on Aug 2nd and waited for confirmation from other sites. Further images from Great Shefford on subsequent mornings gave only a suspicion of cometary activity (images c & d). The object was announced on IAUC 8174 late on 2003 Aug 5 after observers at Klet (246) had reported a wide tail in p.a. 260° on images taken Aug 3.01 and Grasslands Observatory (651) had also reported a possible tail spike 5" long in p.a. 300° on Aug 3.38 and a possible fan-shaped tail 5" long on p.a. 260° on Aug 5.33. 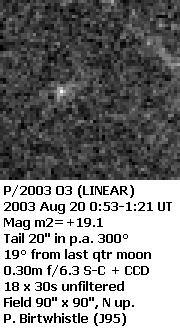 This image of P/2003 O3 was taken 6 days after perihelion passage when it was only 19° from the last quarter moon and is at the same scale as all the other P/2003 O3 images. The tail seems more prominent even though the total exposure of 9 minutes is less than images c) and d). The comet was at opposition, three months past perihelion, but receding from both Sun and Earth and fading fast when this image was obtained in mid November 2003.